Jack Johnson came to the University of Miami from Pittsburgh, Pennsylvania where he played running back. In college football in those years, the rules allowed for only minimal substitution and many players played both offense and defense, often for the entire game. Jack Johnson played both offensive and defensive end on a team that featured UM Sports Hall of Fame members Don Bosseler, Tom Pratt and Sam Scarnecchia. Jack averaged over 50 minutes of playing time per game. 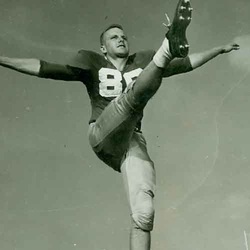 In addition, in 1955 and 1956 he was the team's punter. In 1956 he was named to the All South team and honorable mention AP and UPI All-American. In 1957 Jack declined an offer to play professional football from the Toronto Argonauts of the CFL, but after a special invitation to play in the prestigious Chicago Tribune Charities College All Star Game, he was heavily recruited to play for the Chicago Bears by the famous George Halas. Jack went on to a professional career with the Chicago Bears and the Buffalo Bills.